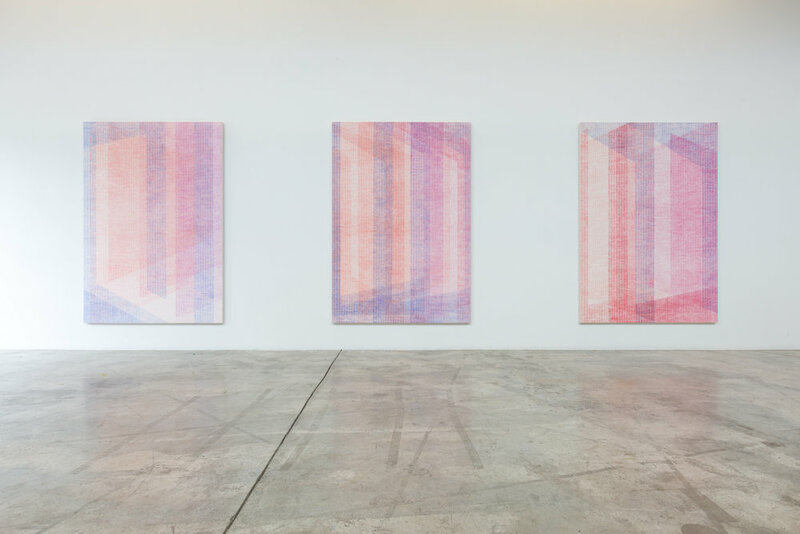 For her first solo exhibition at Diaz Contemporary, Montreal artist Marie-Claire Blais introduces three recent bodies of work, each activating the different ways that we apprehend form and space, and organize it in our perceptual memory. 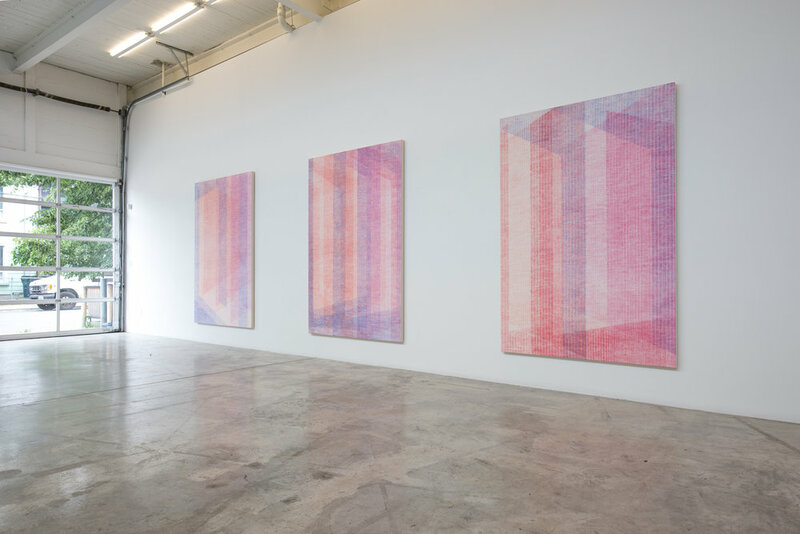 Diffusion and diffraction of light are key emblems in her work, articulating a space between viewer and stage of action, delineating the threshold between them, offering a route of access. WALL Where the lines in the works of Tracé d’un clair-obscur converge at the vanishing point and privilege the act of the gaze above the reward of its destination, in the works comprising Entrevoir le jour, 2014, Blais alludes to the division between day and night, when daily activity fuses into dream. This “wall” is a filter, a threshold in constant flux, light and dark, shifting between blocking and permitting a view, ultimately camouflaging itself. 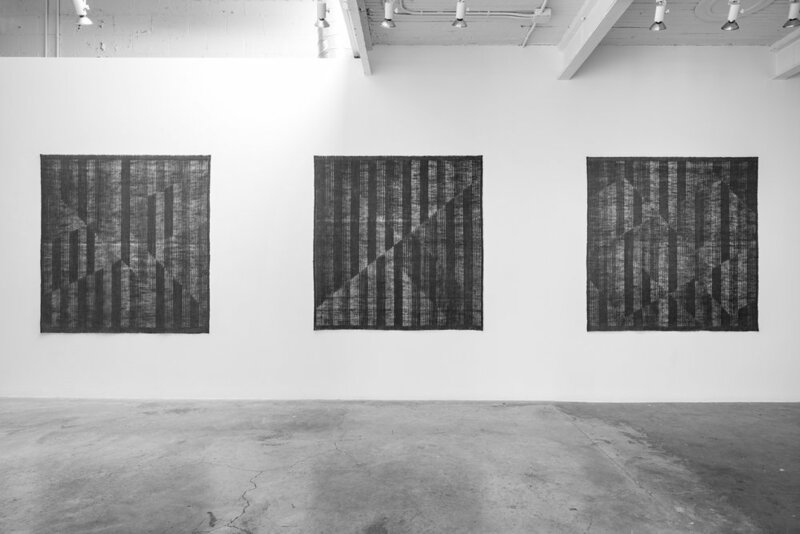 Across the surfaces of dyed burlap, the works reveal instances of fine threads of burlap gently removed, creating voids, where the subtraction of substance equally pronounces a constituent solidity. The exhibition ROAD WALL DOOR acts like a transitional passage through these three stages of moving through space and time, giving form to the way we process what we see and how it is absorbed into memory.